I'm assuming we all have our annual must-watch movies around Halloween time, am I right? Who am I kidding, of course you do! You've probably already drawn the conclusion that I do, too. Surely the title of this post didn't give it away. Let me be honest here for a second, I'm a sucker for just about anything Halloween related, especially movies. Hell, the movie doesn't even have to be good. As long as it conveys and evokes that Halloween spirit of mine, then I'm in! Now I really only have two movies that I absolutely, under any circumstances, must watch on or around Halloween -- no questions asked. And these two little gems are ERNEST SCARED STUPID (1991) and JACK-O (1995). I was first introduced to the ERNEST movies at a very young age. In fact, the first two I ever seen were ERNEST SAVES CHRISTMAS and ERNEST SCARED STUPID. I had them both recorded on VHS tapes. I remember my SCARED STUPID VHS was a Showtime recording, complete with before-the-feature commercials! Back in a time when cable was -- dare I say it -- cool. 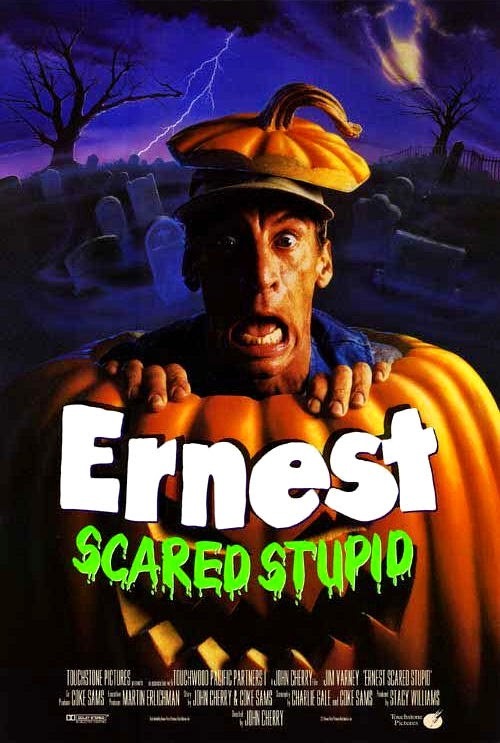 So needless to say, it's the nostalgia that keeps me watching ERNEST SCARED STUPID year after year. Have no fear, though, as I have purchased the Bluray and no longer need the VHS, save for those cool commercials. And my second absolute must-watch is JACK-O, which is probably right up there with TROLL 2 for worst movie ever made. Ever. Much like the cult following of TROLL 2, I can't take my eyes off JACK-O because it's so bad that I've grown to love it. When I caught wing of a 10th Anniversary Special Edition DVD, I knew I had to own it. What could be cooler? How about the director commentary. Priceless. Worth the price of the DVD alone. If for some unexplained reason you have not had the pleasure of seeing these two movies, please do yourself a favor and buy them. Don't rent them. Don't borrow them. Buy them! You will not be disappointed. I can promise you that.